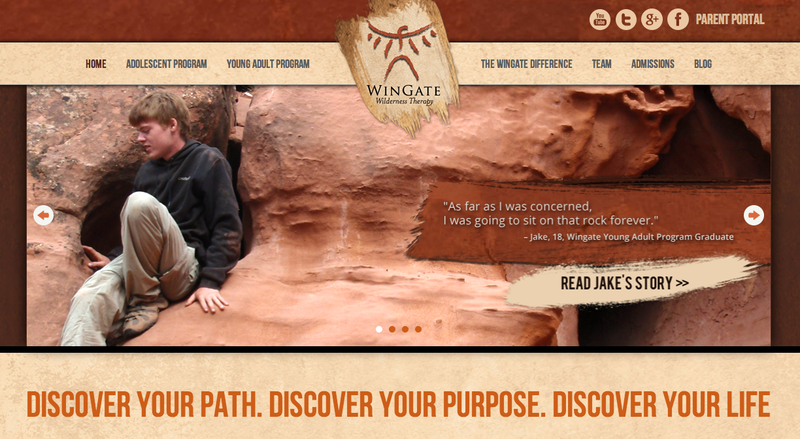 WinGate is a wilderness-therapy program for adolescents and young adults whose website did not effectively reflect the company’s brand. WinGate had invested a great deal of resource and effort into a focused SEO strategy to get more visitors to their website. The campaign was highly successful in terms of driving traffic, but not in terms of turning visitors into clients. WinGate approached us to improve their website’s design and navigation to help convert visitors into clients. Since WinGate’s high success rate with clients is due to their unique approach to forging strong client-therapist relationships. After interviewing staff and clients, MANE BRAND determined that the most effective and authentic way to convey WinGate’s brand was through storytelling. The new website describes WinGate’s key brand features through true stories (fictionalized to protect identity) and matching images. It also incorporates the “leather and wood” feel of WinGate’s rustic outdoor program and matches its print collaterals.